an eye back then — he was in the movies. It took considerably longer before he entered the toon world, but once he did, he was all over it. His first appearance in cartoon form was as a newspaper comic, on Monday, January 7, 1929 — the same day as that of Buck Rogers, a double debut that some consider to have marked the beginning of a golden age of adventure comics in the papers. The storyline was a close adaptation of his first novel, Tarzan of the Apes, in which the baby Tarzan is orphaned in the jungle, raised by apes, and grows up to woo the lovely Jane Porter. The artist was Hal Foster, who later became famous as the creator of Prince Valiant. From the very beginning, Foster was praised for his anatomy, panel composition, draftsmanship, and just about every other aspect of his work. But once the initial ten-week series was over, he went back to advertising. The Metropolitan Newspaper Service (later United Feature Syndicate, distributor of Nancy, Gordo and Peanuts) renewed the series, assigning staff artist Rex Maxon to the feature. Maxon is best known for his Tarzan work, tho he also did a few Turok, Son of Stone stories in the 1950s. Maxon also did the Sunday page, which began on March 15, 1931. A few months later, Foster returned, taking over the Sunday from Maxon on September 27, 1931. When he was first offered the job, he considered it something like selling his birthright for a mess of pottage — but on reflection, thought, "Wouldn't it be nice if I had a little bit of pottage right now?" Later, he acknowledged having gotten through the worst of the Great Depression by, as he put it, "eating ape". In 1937, Foster moved to King Features, where he launched Prince Valiant, and Tarzan was taken over by Burne Hogarth (Drago, Miracle Jones). Many consider Hogarth the best of the Tarzan comics artists, which is quite an accomplishment, considering the quality of the competition. Later artists on the strip include Bob Lubbers (Long Sam), Russ Manning (Magnus), Mike Grell (Jon Sable) and Ruben Moreira (Roy Raymond). Tarzan is still running, tho it's been in reruns for several years — currently, it's reprinting the work of John Celardo (Tales of the Green Berets). The Tarzan strip was reprinted in various comic books that specialized in United Feature comics, e.g., Sparkler and Tip Top Comics. Also, reprints from the Hal Foster run were featured in a 1940 issue of Single Series, each issue of which was devoted entirely to one especially popular United Feature offering. Others that starred in Single Series include Li'l Abner, Ella Cinders and The Captain & the Kids. Art by Foster, Maxon and Hogarth was also reprinted in Big Little Books, Little Golden Books, and in many other forms. It was in 1947 that Dell Comics put him in his own regularly-published comic book, first as a couple of issues of Four Color Comics, the catch-all title where Beany & Cecil, Huckleberry Hound and many, many others made their comic book debuts, and then in a title of his own. First by Dell, then Gold Key, DC and eventually Marvel, Tarzan appeared continuously in that medium for more than 30 years. 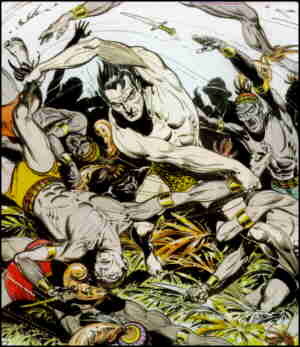 A notable side feature of the early Tarzan comic book was its back-up series, Brothers of the Spear, among the first in U.S. media of any sort in which a black and a white man worked together as equals. For a time during the 1960s and '70s, Tarzan's son, Korak, also had his own comic book. The artist during most of the first couple of decades was Jesse Marsh, another best known for Tarzan. Later artists include Joe Kubert (Hawkman), Gil Kane (Green Lantern) and John Buscema (The Silver Surfer). In more recent years, Tarzan has been adapted into comics by Dark Horse Comics (Sin City, Concrete). He also sparked quite a few imitators in comic book form, including Kaanga, Ka-Zar, Jo-Jo the Congo King, Wambi the Jungle Boy and many, many others. Sheena, Queen of the Jungle, was the first of many female Tarzan knock-offs (Burroughs's own Nyoka the Jungle Girl came earlier, but doesn't qualify as a Tarzan imitator). Tarzan parodies, such as George of the Jungle, also abound. And in 1964, Charlton Comics, acting on an erroneous belief that the character had fallen into the public domain, brought out an unauthorized comic book adaptation of Tarzan short stories, Jungle Tales of Tarzan. It was shut down after four issues by the heirs of Edgar Rice Burroughs (who had died in 1950). Tarzan first appeared in animated form in 1976, when Filmation (Fat Albert, He-Man) produced Tarzan, Lord of the Jungle for the Saturday morning TV audience. His voice was done by Robert Ridgely (Thundarr, Flash Gordon, Purple Pieman in Strawberry Shortcake). Ridgely reprised the role in Tarzan & the Super Seven (1978) and The Tarzan/Lone Ranger/Zorro Adventure Hour (1980). By far, the best known animated version of Tarzan is the feature-length theatrical presentation released by Disney on June 18, 1999. There, he was voiced by Tony Goldwyn, a face actor with few other voice credits — but who did Tarzan a couple more times in Disney-produced video games over the next few years. Michael T. Weiss (The Demon in several animated Justice League of America episodes) voiced him in other follow-ups, such as The Legend of Tarzan (a half-hour TV series that began September 3, 2001 and ran one season of 20 episodes) and Tarzan & Jane (released to video July 23, 2002). In Tarzan II (released to video June 14, 2005), which explored his boyhood, his voice was done by Harrison Chad (Boots the Monkey in Dora the Explorer). Nearly a century after his introduction, Tarzan is still a viable property in prose, film, and every other medium. Undoubtedly, he still has a lengthy cartoon career ahead of him. Text ©2005-10 Donald D. Markstein. Art © Edgar Rice Burroughs Inc.